As someone who studies and researches ancient Egypt from a very conservative and traditional perspective, I’ve witnessed a lot of misrepresentation and speculation attributed to this long-ago culture. A great many people have an innate affection for the civilization of ancient Egypt: the scholars and academics who research it professionally, enthusiasts and amateur historians such as I, and those who are drawn to it for mystical and New Age reasons. Along the way the civilization of ancient Egypt is frequently misrepresented among the general public, whether this be from a simple lack of familiarity with the civilization or from alternative historians or fringe adherents striving to serve a personal agenda. There is essentially no reason to doubt our understanding of nTr, however. The use of this word is amply attested in the historical record all the way back into the late-prehistory of the Nile Valley. But before we break down what this word meant to the ancient Egyptians, let’s eliminate a couple of examples of what nTr did not mean. It is not the origin of our word “nature,” for instance. Our word “nature” and its meaning of the collective world of plants, landscapes, animal, and people ultimately derives through Old French from the Latin nasci (link). In point of fact the Egyptians do not appear to have had a word that would equate to our word “nature.” My own feeling on this is–as with the absence of a name for their religion in the way we use terms like Christianity, Judaism, Islam, and Hinduism today–the natural world was an innate and intimate part of every-day life and was not viewed as something separate. Also sometimes suggested is that the word “natron” comes from nTr. This has been argued for ages in academic circles but no convincing linguistic evidence has ever been posited to corroborate the argument (Hornung 1971: 41). There is an Egyptian word ntryt that exists in one fragmentary source that has been posited as “natron,” but even here the evidence is not compelling (Faulkner 1962: 143). The word nTr is usually translated as “god” or, as an adjective, “divine.” Based on how the Egyptians themselves used the word, this translation is sound. In Greek the equivalent word is theos, and in late bilingual inscriptions where nTr and theos appear more or less side by side, it is clear that “god” is the meaning (Dunard & Zivie-Coche 2004: 8). Going in the other direction, all the way back to the dawn of state formation in Egypt (c. 3100 BCE), the meaning seems to have started in the same way. The ancient word nTr survived through pharaonic history and in the worship of Coptic Christianity became the word noute for God (ibid). From their own iconography, the Egyptians showed us that such a standard was typically presented in pairs outside the entrances to temples. This was the case as well in prehistory (Wilkinson 2003: 27), such as at important ritual sites like Hierokonpolis (ancient Nekhen). From the start the symbol was intimately associated with the divine and with ritual. 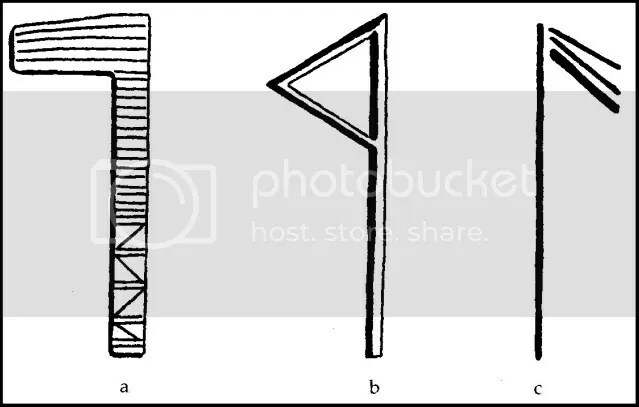 Drawing from the above diagram, the most common form of the pole and banner through pharaonic history was the example at left (a); the middle example ( b ) appears in iconography in the earliest dynasties, and early scholars originally mistook it for an axe (Hornung 1971: 34); the example at far right ( c ) is how the symbol appears in iconography in late prehistory. That this symbol came to represent the word “god” or “divine” must have been a natural progression for the Egyptians; examine the ritual slate palettes of late prehistory and the Early Dynastic Period, and you will see how standards and banners stood as important iconography from the beginning. The term nTr in the singular generally meant “god,” as in a singular male deity; it was abundantly used in this sense and often without reference to a specific god. This should not be taken to mean the Egyptians believed in the One God as in the Judeo-Christian sense, a misconception under which many early scholars labored (given their classical training in biblical studies). In his important book Conceptions of God in Ancient Egypt (1971) the eminent Egyptologist Erik Hornung laid this idea to rest definitively. Polytheism is the general consensus today, and it has been noted how the flag could be used to denote “deity” in a generic sense (Wilkinson 2003: 27). The feminine marker was used to indicate a goddess (nTrt), and the plural (nTrw) could be indicated in a number of ways: three flags; a single flag with three vertical strokes; and, in late examples, three flags interspersed with three cobras (Wilson 1993: 85-87), the cobra itself representing divinity and/or divine kingship. Facets of nTr are evident in the mortal world of the ancient Egyptians. It is an exaggeration to suggest that all Egyptian kings were regarded as gods, but these kings were certainly viewed as someone much closer to the gods than ordinary people were. The king’s status as semi-divine is reflected in one of his titles, nTr nfr, meaning “Perfect God” or “Beautiful God.” The dead were seen as somewhat divine themselves, having gone on to live forever in the land of the gods. The Egyptian word for “incense” was snTr, which literally means “to make deified, divine” (Dunard & Zivie-Coche 2004: 12). The Egyptian nTr seems also to have been intimately associated with the dead, as I intimated above. Until recent times flagpoles were commonly set up outside tombs in North Africa and Sudan, reflecting a tradition seen in pharaonic Egypt going back into prehistory; some have argued that nTr may have originally referred to the dead (Hornung 1971: 37, 42). The etymology and origin of the word nTr remains unknown, despite decades of attempts by linguists to try to identify cognates and other connections to Afro-Semitic languages, but its meaning is not a mystery. The Egyptians themselves left us an ample record of the word to examine. Dunard, Francoise & Christine Zivie-Coche. Gods and Men in Egypt: 3000 BCE to 395 CE. 2004. Hornung, Erik. Conceptions of God in Ancient Egypt: the One and the Many. 1971. Wilson, Hilary. Understanding Hieroglyphs: A Complete Introductory Guide. 1993.